If you yearn to live a life of meaning and purpose, joy and peace, then Christianityworks is for you: full of life-changing, practical Bible teaching to help you live out the victory that you already have, in Jesus Christ. Daily 3 Minute Video Devotional taking you deeper into God's Word + closer to Jesus. Watch, listen or read. It's your choice. Even subscribe to receive it daily to your inbox! Daily 10 Minute Message exploring issues we all face in life ... from a different perspective; the sorts of things that really matter day-to-day. Listen or read. It's up to you. In Depth Weekly Bible Teaching: Join Berni Dymet as he opens God's Word to discover what God has to say into your life, today. Watch, listen or read. Whichever works best! Short, 60 second "think spots" to help you engage with the powerful truths of God's Word. Listen to the audio or read the text. It's up to you! Enjoying The Content? For the price of a cup of coffee each month, you can enable Christianityworks to reach 10,000+ people with a message about the love of Jesus! Thank you for giving as the Holy Spirit leads, to help share the Gospel of Christ with countless people, in over 160 countries around the world. Daily words of inspiration, hope and encouragement - delivered directly to you. Thanks! We are just processing your donation. Your gift is going to help us reach so many more people with the good news of Jesus. 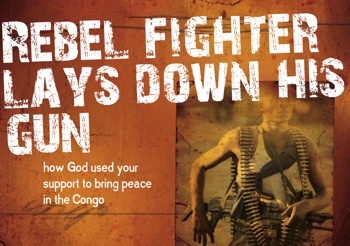 People like the terrorist in the Democratic Republic of Congo, who had killed many people, but laid down his gun when he heard a Christianityworks broadcast. So thank you - not only for waiting, but for your love and generosity in helping to reach the lost around the globe with the saving love of Jesus! May the Lord bless you mightily.